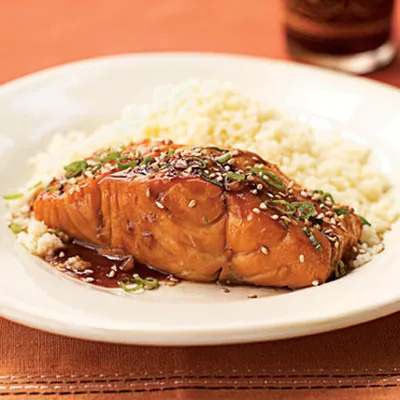 Ginger, soy sauce, bourbon, and brown sugar make a flavorful glaze for this dish, which boasts ingredients essential for staying healthy this winter. Not only is this salmon dish full of flavor, it also boasts ingredients essential for staying healthy this winter. Salmon is loaded with essential vitamins and nutrients, including vitamin B12, vitamin D, selenium, potassium, and Omega-3 fatty acids. Eating fish rich in omega-3s like salmon is associated with decreased risk of cardiovascular problems including heart attack, stroke, and high blood pressure, and eating omega-3's also supports healthy joints and eyes. Ginger adds a little kick to this dish, plus it's great for digestive health and has amazing anti-inflammatory properties. Ginger can also boost your immune system, which is vital in the winter months. And don’t worry about the bourbon—the alcohol gets evaporated in the cooking process, leaving behind that beautiful smoky flavor which brings out the saltiness in the soy sauce and the sweetness from the brown sugar. Try pairing this dish with some steamed green beans or bok-choy.